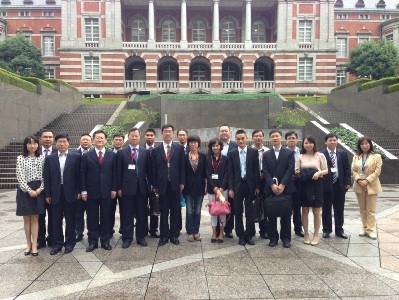 The delegation of the Legislative Affairs Committee of National Law Bureau (19 members) of the National People’s Congress of the People’s Republic of China (hereinafter referred to as “China”) arrived in Japan on September 1st 2013. During the two weeks through September 14th 2013, they went through training program in the field of “legislation”. This is the second delegation visiting Japan, following the one last year. Having the enactment and revision of draft laws discussed in the Standing Committee of the National People's Congress in mind, they came to attend the training program in Japan so that they could understand the system of law in foreign countries such as Japan, where the system of drafting and revising laws were well organized. They hope to utilize the idea to prepare the ground for Chinese laws. JICE planned and conducted this program based on the request by the Legislative Affairs Committee for Standing Committee of the National People's Congress of China. Lectures were held at the Upper House, the Lower House, the Cabinet Legislation Bureau, and the Ministry of Justice of Japan respectively. They also visited the Supreme Court, and the regional municipal governments such as the Hokkaido Government Office where they’ve actively exchanged views. They also experienced the Japanese Style Tea Ceremony and learned some of the lessons which one must keep in mind for those engaging in law.